Recently a client came to me wanting to know if she should do this or that. The spreads I have used in the past for such an inquiry didn't feel adequate for some reason, so I scribbled in my notebook for awhile until I devised this spread. It provides pros and cons for both available options. It also shows what force is drawing you to each choice, as well as a "bottom line" and message of advice. 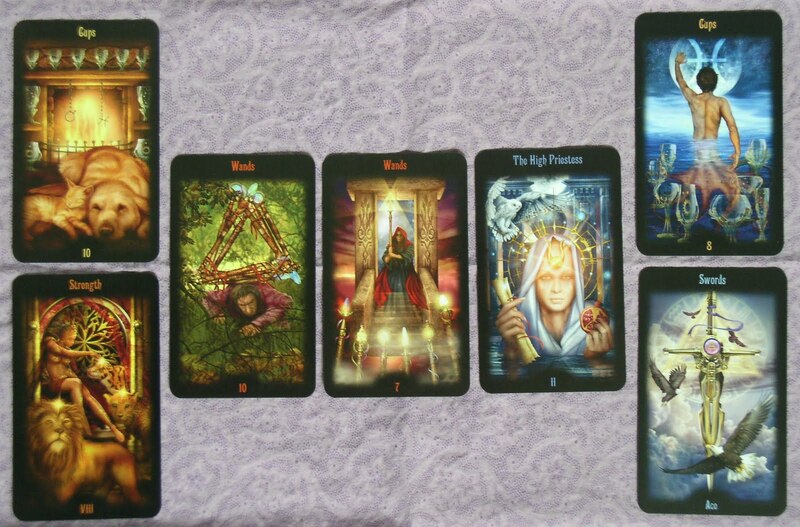 I wanted to share this spread here because I have used it many times since, and it always provides very clear answers. It's definitely become my go-to spread for this type of reading. Before laying out the cards, decide which of your options will be #1 and which will be #2. 1. Pro for Option 1 - The benefit of choosing Option 1. 2. Pro for Option 2 - The benefit of choosing Option 2. 3. Con for Option 1 (taken from bottom of deck) - The downside to choosing Option 1. 4. Con for Option 2 (taken from bottom of deck) - The downside to choosing Option 2. 5. Bottom line (taken from bottom of deck) - The single most important thing to consider when deciding. 5-6-7. Message to consider - Read these three cards together as a summary. Of course you can read it in any order that is most comfortable to you. I have a couple websites in mind to create, but want to focus on only one at this time. I wanted to know which option was a better one to pursue right now, if I have to choose only one. This is a website that would begin with word of mouth from friends and family. The Ten of Cups shows a comfort level with the people I would begin working with on this site. What stood out to me in this card was all the feline eyes on me. I will have the people closest to me watching me, seeing if I succeed or fail. That pressure will cause me to possess and display a certain strength. I will have to really believe in myself if choosing this option. This website will be building on a business I already have been working on. It's not as new as the first one. This card represents the progress I hope to achieve as I take my work to the next level. I don't know why, but I saw the eagles in the card as vultures... circling around, waiting for something to die. Looking at this card, I heard profound silence...the aura coming off this card was like the sound of crickets chirping. No business. No progress. It's a cold feeling card, with no human warmth to it. The sword has been placed, but there is nothing happening after that. It doesn't seem as though this option will bring in much more business. I am struggling right now, which makes the comfort of the Ten of Cups very appealing. The hardship I am going through makes me lean more toward the business where I can rely on word of mouth from those who love me, because it feels more comforting and safe. I lean toward this option because I have more knowledge and experience invested in this business. It's not new to me. And it has more of a mystical side to it than the other one will allow me to have. What I saw in this card was a question: "If you had so much business that you had to beat people off with a stick, which business would you prefer doing?" If success came to me in such a rush, which option would be better for me? Financially, Website #1 would be slightly more advantageous for me. If I'm looking for a higher degree of fame or acknowledgment, it would be Website #2. So, if choosing between the two, I would probably go with #1. There is a man crawling on the ground under the weight of the wands on his back. His load is so heavy he can't even stand any longer. In the next card, he puts the wands down and keeps only one. The crystals at the end of the wands are glowing like candle flames. With just the one, he was able to light the others. When I make my choice, I will be able to eventually light the flames of other business prospects. But it starts with one. The man stands up straight now and is standing at the threshold of where he wants to be. The High Priestess awaits him beyond the doorway. She has the answers he seeks. This tells me that I need to meditate on it. I have recently begun my daily meditation practice after a long break. I believe this will be the key to confirming my final decision. As it stands, from the look and feel of the cards, I think I will choose Website #1. I think ultimately it will be a bigger challenge for me, but will result in greater personal growth. Looking at the cards again, the orange and furry warmth of the animals in the pro/con cards of Option 1 are in stark contrast with the cold water/air feeling of the pro/con cards of Option 2. This is another layer of depth to the reading pointing me toward Option 1. I will still meditate on it further and see what other advice I receive.